This was built from the original Andy pattern. I embellished the design a bit, altered the seat and covered it with padding and leather. I also added a removable foot peg that could be used for the smallest capable rider. My nephew had had this since shortly after his first birthday. He's been riding since around two, and at 2 1/2 he's outgrowing the pegs and will be touching the platform by three. 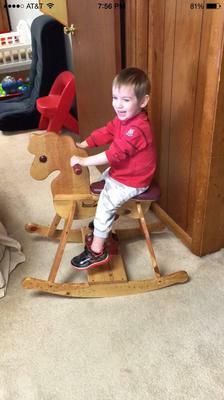 This is the first rocking horse I ever made. The plans are simple and straight forward. By the time I was done, our woodshop had a router, routing table and spindle sander. And I know what a flush trim bit is now. The entire pattern was cut with a jigsaw. Return to Rocking Horse Project Showcase.